Kittens and puppies are adorable, but training can be labor intensive and not always ideal for people with busy schedules. When you adopt a senior pet, there are many advantages. There are no surprises with behavior issues or growth spurts … you know what you’re getting. Senior pets generally have a longer attention span so often training is easier. In general, older felines are more patient with other pets and children in the household. And finally, senior companion animals are often a perfect match with senior citizens. 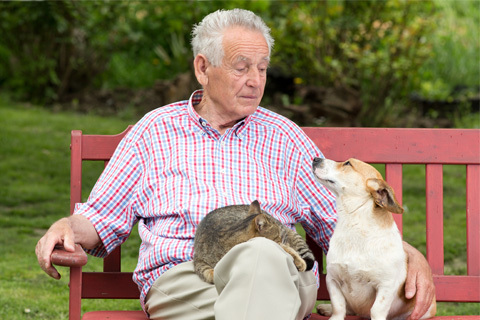 The companionship of an older dog or cat can provide much needed friendship and interaction for seniors who live alone. Dark colored dogs and cats are much harder to place than their lighter colored counterparts. Yes, superstition plays a role when it comes to black cats. Actually, some shelters and rescues will not adopt out black cats during the Halloween season, for fear that some harm might come to them. However, there may be other factors that come into play. I read an article that said lighter colored animals stand out more in a crowd. So when future pet parents go to a shelter to choose a pet, they see the lighter, more brightly colored pets first. The next time you find yourself looking to adopt, don’t forget to look very carefully at all of the animals because choosing the darkest pet could brighten your life for many years to come. American Pitbull Terriers, American Staffordshire Terriers and Staffordshire Bull Terriers and similar mixed breeds are often referred to as Pit Bulls. Many disreputable people have exploited Pit Bull types, training them to be aggressive and to fight. As a result, Pit Bulls top the list as the most euthanized dog in the country. Actually, these breeds are loyal and generally good with children. In the UK, they were known as “nanny” dogs in the 19th century. There are other misunderstood dog breeds that are harder to place including larger dogs like Rottweilers, German Shepherds, Doberman Pinschers, Chow Chows and others. In my capacity as a board member of our non-profit (The Dr. Jane Foundation), I’ve heard many stories about adoptions and successful relationships pet parents have experienced with these misunderstood dog breeds. Finally, there are the dogs and cats with chronic medical problems, often as a result of abuse or misfortune. Some common disabilities include animals who are blind, deaf or missing limbs. In many cases, pets with disabilities are not harder to care for than those that are completely healthy. However, sometimes pet parents may need to devote more time, patience and veterinary care to these pets. Rest assured, medically-challenged companion animals can enjoy happy and fulfilling lives with the right families and they can give back so much more than they receive. If you have welcomed a “less adoptable” pet into your home and experienced the love and affection of these special animals, please post your personal success story now and help us spread the word. On behalf of our Life's Abundance non-profit wing, The Dr. Jane Foundation, we thank you for caring enough to make a difference. I adopted a pug who had only one eye. It has not been in any way a problem for him or for us. Pip loves his agility lessons and does quite well. I have adopted many seniors and watched they live out their lives for many years, up to 19. I never once thought about their age when I adopted them. I have always brought home shelter dogs, never knowing their background. They are so happy to have a loving home they are willing to conform to the house rules, which only consist of going outside to the bathroom. LOL. My latest is a 10-year-old Jack Russell Terrier (I thought I was getting a fat Chihuahua) from a kill shelter in Los Angeles. He got a little Chi to play and my Border Collie mix tired out from play with him. He had some skin issues, which corrected with Life's Abundance Skin and Coat!